How do you, as a licensee or manufacturer, grow your business? How do you identify brands you want to license? How do you perform due diligence on a brand to ensure they’re right for you? How do you become a contender for their business? What’s the best way to tilt the negotiations to your favor? And if you win the business, how do you establish a business plan to ensure profitability? After 30 years in the licensing business (including Coca-Cola and Newell Rubbermaid) I can tell you how: Through a disciplined approach that marries your strengths with the licensor’s needs. In this article, I’m going to answer just about every question you, as a manufacturer or licensee, might have about finding prospective brands, winning, and profitably running a licensing program. Let’s get started. As you search and evaluate potential brand owners, don’t approach it with a mindset of being the lesser party without authority. Approach it with the understanding that you also have the power to decide what best benefits you and your organization. There are four ways to prospect licensors: Research, trade publications, store walks, and trade shows. I go into great detail of how to get the most out of each method in my downloadable guide, Licensing From a Manufacturer’s Perspective: A Disciplined Path To Licensing Brands And Making Them Profitable. For now, let’s say you’ve zeroed in on one particular brand that looks promising. What next? Even though the brand you have under consideration is an entity of the brand owner, it is important for you to know its essence. What does this brand mean to the brand owner, others in their organization, customers, and consumers? Do consumers and customers find the brand differentiated and relevant compared to the competition? Take Coca-Cola, Google, and Apple for instance. Each brand’s essence is different from the other and means different things to the people in whom they are in contact. In my guide for manufacturers and other licensees, I show you how to understand your target’s brand positioning. Why is this important? If the brand you want to license does NOT occupy a clear, distinctive, and desirable place in the mind of a target consumer, you might win a license that is decidedly difficult to market. What Are The Brand’s Strengths & Weaknesses? My guide also shows you how to assess the brand you’re thinking of licensing through a SWOT analysis. It will assist you in measuring the brand’s strengths, weaknesses, opportunities, and threats; internally and externally. It is part of your responsibility to research the brand thoroughly to gain a sufficient amount of knowledge of the parent brand’s equity, the brand’s positive and negative associations, addictiveness, competition, captured market, target market, presence and so forth. Just because you are the licensee doesn’t mean that you can walk into this license blindly. By understanding the ins and outs of the brand, you’ll gain a competitive advantage. I can’t tell you how impressed brand owners are with a licensee’s ability to articulate the brand’s strengths and opportunities while countering its weaknesses and threats. Click here to see how to conduct a SWOT analysis of your targeted brand and how to use it to win business. The parameters licensors measure licensees against. 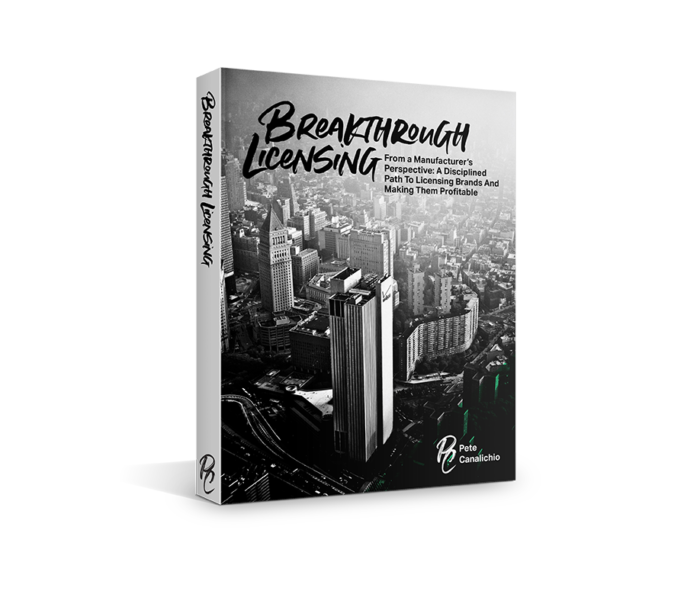 Most brand owners will ask you to thoroughly complete and sign a Licensee Application to provide the licensor with in-depth information related to your organization. Want to see what a typical application form looks like? Click here for the template. 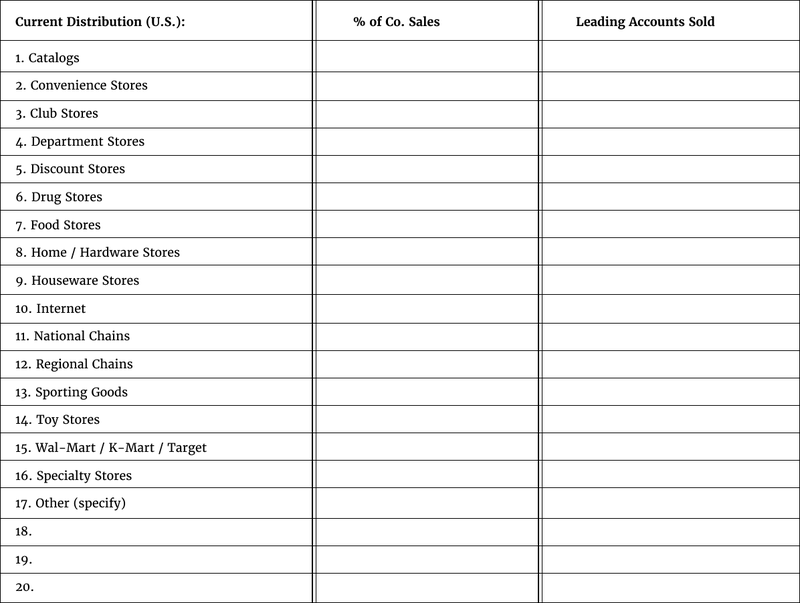 Below you’ll see an important part of the template: Channel distribution questions. As a prospective licensee, you must qualify your distribution by channel and give a percentage of the sales of the product you are selling in each particular channel. The licensor uses this information to verify that the percentages align with the channels that they prefer you to sell through. Analyzing your history of innovation provides an overview of where you started and where you’re going. If you have a track record of making refinements, filing patents and improving your products’ features and benefits, then that is a good indication of future success. What is your manufacturing capacity? Are you going to able to handle the consumers’ demand for the brand in the present channels? If the brand is enjoyed by many, one can assume that demand for the product will increase substantially. To meet this demand, you must be ready to make a substantial investment. Moreover, you must have the right distribution system(s) in place to reach consumers. Would you be able to do that? Are you selling in the channels that the licensor desires? Do you have a category captain status in that particular channel? If so, then the licensors know they are going to have a better chance of success. Click here for 7 other critical questions brand owners have about you. Due diligence centers around the application form but it also includes interviews, conversations, and emails to gain a better understanding of who you are and if you are a qualified prospect. In the strategic stage, licensors want to know that you clearly understand both the consumers and the brand. They also want to ensure you have a strong product development process, understand and value the importance of market research, have a robust appreciation for marketing, and will allocate the right percentage of your revenue to supporting the license in this category. In this stage licensors also will assess if your leadership is strong, if you believe in their brand, and if you can deliver on what you say you are going to accomplish. Licensors will even use the Category Captain designation as a measurement of your leadership along with the relationships you have developed with retailers. As the licensor investigates your relationships with the buyers and senior retailer leadership, they will gain a greater perception of your company. Next, they reference your channel presence to see if you have an extensive presence with “40 feet of shelf space” in the category or “2 feet of shelf space”. Then the licensor will evaluate your innovation capabilities. Licensors want to know your constancy in coming out with new technology and new products or if you “leave well enough alone” and stick with old technology developed decades ago. Once they have a good strategic understanding of the business, the licensor will start evaluating your financial strength. Click here to see what licensors examine to ensure you won’t be a financial liability to them. Brand owners will also evaluate the legal risk you might pose and finally, your organizational competency. Brand owners want to know how much revenue your organization will generate and how it will be derived, i.e., the metrics including regions, retailers, and SKUs, so that when they define the Anchor Deal Terms, i.e., the core terms of the license, they will be able to formalize the agreement. The desired outcome focuses on the product concepts, Initial Sales Forecast, your strengths and capabilities, and the Deal Parameters. Who are the primary competitors in the category that you want to license? How will the proposed products look and differ from the competition and in which way will you be similar? Certain features represent “points of parity” and are standard in the marketplace. The features you can offer to differentiate the licensor’s brand are going to be the key drivers of success. What are the Projected Annual Sales of the proposed product? Here is the first time you as the licensee will share your thinking on what the Projected Annual Sales of that proposed branded product are going to look like for Year 1 and Year 2. This will give the licensor a snapshot of how much you are willing to invest in their brand in this category. This forecast is one of the first areas the licensor wants to look at to see whether or not you even are in the ballpark from where they want the brand to be regarding sales and market share. If their brand is at 15 percent, 20 percent or 30 percent market share in all their other categories, then they have a good expectation of where the brand should be long term. These are the percentages they should be anticipating you to reach in an extended category over time. Click here to see the rest of the questions you’ll be asked in this area. 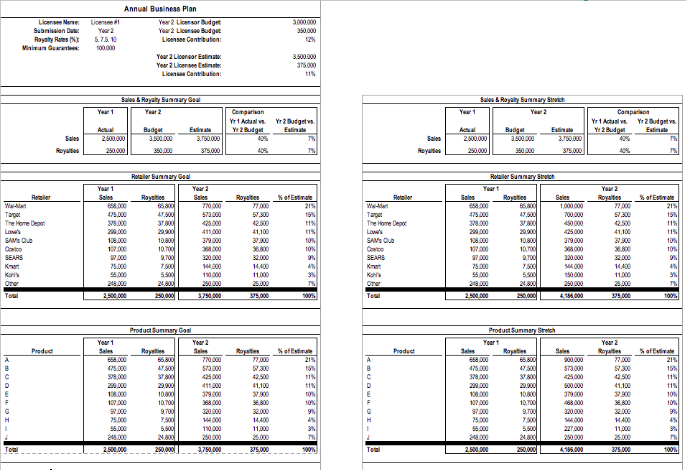 My Conservative Business Estimator enables you to provide the licensor with a three-year detailed forecast by region, channel, retailer, SKUs, and annual product innovation. This level of robustness is critical to the long-term success of your program and the licensor’s brand in that particular category. The sales projections and their viability are then compared to other licensee candidates to see which of you, if any, are going to be chosen for a license in a particular category. 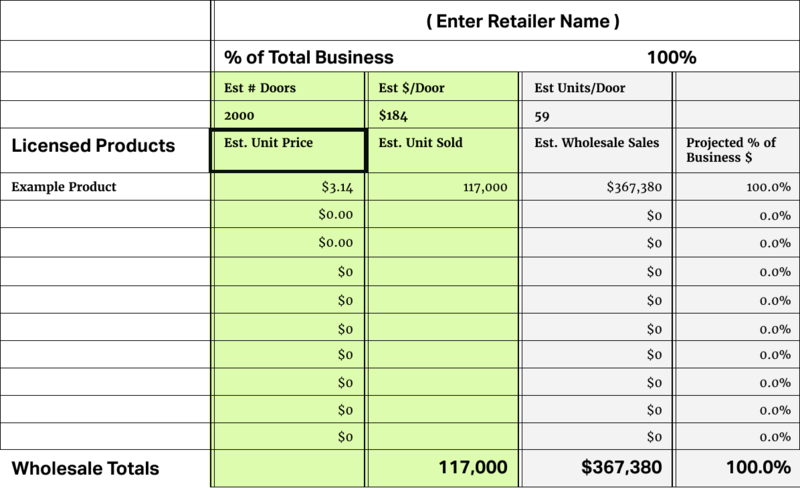 Below you’ll see one part of The Conservative Business Estimator, which asks for the type of product to be listed by Stock Keeping Unit (SKU). Suppose that the product is a kitchen step-ladder that provides one, two, and three-step stepladders. If there were more than one SKU, you would list each one here. A completed estimator will help you understand, in detail, the size of the opportunity as it relates to licensing your brand in the particular category. As a prospective licensee, you are asked to present the overall business plan assuming you already hold the license. Once the Licensee Application and The Conservative Business Estimator are complete, the licensor wants you to take all the information that you have compiled up to this point and propose a business plan that assumes that you have received the license. They want you to present the concepts in the channels and in the regions that you requested be stipulated in the license. They also want you to tell them why you should earn their business and convince them that this is something important to you. Treat this concept review like an internal meeting where the licensor is the general manager, and they are talking to you, the head of a particular product development team. When you are presenting the business plan, treat this presentation as if you currently have the brand in the marketplace in that category. Explain what you are going to do with the license, where, when, what price, what SKUs, etc. In this case study, I portray the brand owner who is going to ask the prospective licensee questions and record their answers. I´m going to evaluate prospective licensees based on the criteria listed below. As you read through this example focus your attention on what the licensor is looking for and how they determine which licensee provides the best benefits. Based on the information provided I´m going to eliminate Prospect A first. They are third in market share, only have one channel of access, and well, for a complete breakdown of how I analyzed the licensees click here. LINK You’ll also see which licensee I eventually awarded the business to and why. You have demolished your competition and secured the number one position for the license that you have worked so hard to obtain. Though this is a big step, don’t become overconfident. There is a possibility that while in the “Negotiating Contract” phase that disagreements could take place that may lead to either party backing down from the deal. Negotiating a contract can be overwhelming for everyone involved. This is especially true since every organization has different needs and goals to fulfill through the process. Since the value of the Deal Terms will be unique to every licensing contract, they must be negotiated between both you and the licensor. In my guide, you will have an opportunity to learn exactly how “win-win” contract negotiations are created for both you and your licensor. To increase your understanding of this topic the chapter has been divided into two separate sections. In this first section, the discussion will focus on Agreeing Deal Terms and how to get the Internal Approval Sheet approved. Let’s begin. Click here to see my detail views of each Deal Term. The Deal Terms Summary will be completed by the licensor and then given to you to sign. This summary is not a contract nor is it binding on either party. Signing the Deal Term Summary is a vital component of a successful licensing program. In my experience, verbal agreements of Dealt Terms cause confusion and misunderstandings. Put it in writing and have both parties sign it. The physical signing of the Deal Term Summary does not constitute an actual contract, but it does eliminate any confusion going forward. Click here to see what you should watch out for in each Schedule. Well done! Negotiations have been finalized, and the contract has been signed. The execution of the contract signifies the beginning of the relationship. Shortly after the contract has been signed a formal orientation session should be scheduled and conducted. It helps build an ongoing relationship between you and the licensor. There are also a host of requirements laid out in the licensing agreement that are intended to make the program successful. This includes understanding the brand, to getting the products approved, to commercializing the product in the marketplace. To do this effectively requires a great number of personnel from both the licensor and you. The orientation process allows for both parties to grasp this understanding. You are responsible for the most crucial asset of the licensor’s company, which is their brand. Therefore, you must have a deep understanding of the brand. In addition, you must also build the attributes of the brand into the licensed products you intend to create, obtain the requisite approvals in the right way, and follow the guidelines. The orientation process ensures the commercialization of the licensed product in the category takes place. This will be your chance to reveal to the licensor the new officially licensed products entering the marketplace that consumers are clambering and craving. Finally, the Orientation Process helps ensure that you meet and exceed the contract obligations. It is not sufficient for you to hit the minimum requirements laid out in the contract; you should be striving to hit your mutually agreed Sales Targets and the corresponding Royalties to increase the overall success of the license. When this happens not only will the licensor be happy, but you will also be very successful. Click here to see a detailed account of what should happen in the orientation. As you align yourself with the overall business objectives of the licensor, your chance of having a great deal of success is going to be high. In this final step, you will learn how to structure your business plans and ensure alignment with the licensor’s business objectives to develop steps towards success.